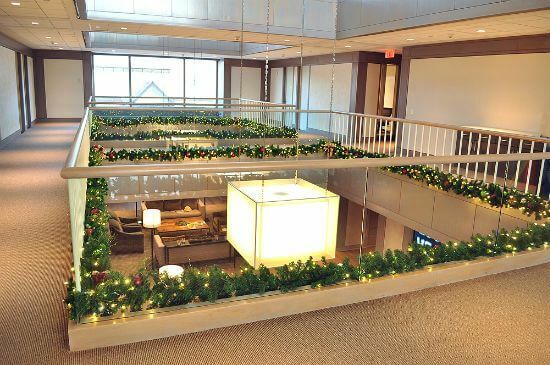 I-Plants Magazine 2013 Design Award for Holiday Decor – Atria, Inc.
Atria is honored to have tied for first place in the I-Plants Magazine 2013 Design Award – Holiday Decor category. It was a team effort from the design concept, to the production, to the installation, and we have the best team! 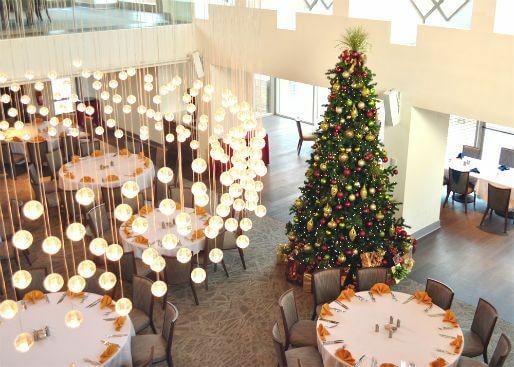 Having just completed a large renovation of the campus, our client was looking for a fresh, new design for the space that would compliment their décor and create a festive holiday atmosphere in an elegant way. 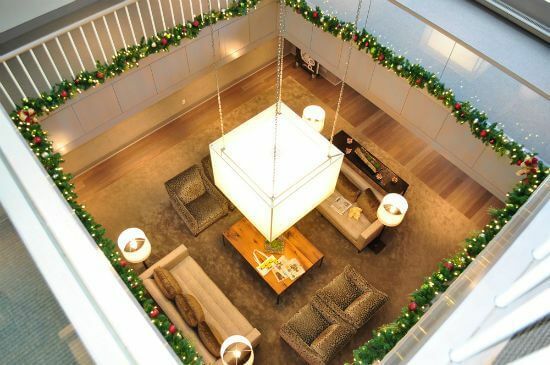 We approached the design and color scheme in such a way that the architecture and the sleek, modern furnishings would simply be enhanced but not over powered by the decorations. The space is very bright with an abundance of natural light. This allowed us to go with a rich deep burgundy in our palette which has the potential to be lost among the foliage. We added the lime green and platinum for a nice pop of modern color, and the gold to add a touch of traditional color. The color palette and combination of ornaments and ribbon used is very unique. We mixed pattern, shapes and textures together that really created a custom look for our client. To see more of Holiday Designs by Atria’s portfolio, click here.